ALERT BAY B.C- RCMP in Alert Bay have concluded that a fire that destroyed two houses on 2nd Street Monday night was considered suspicious. 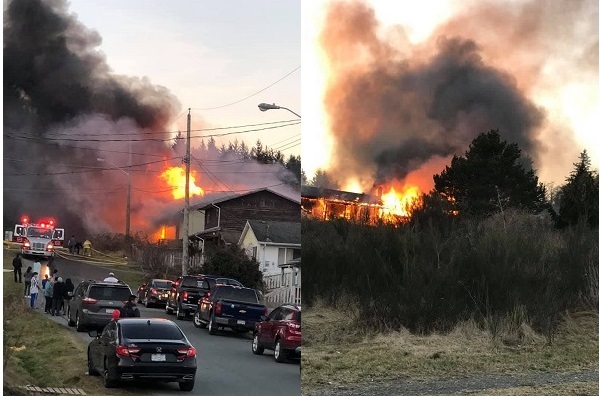 On Monday, March 18th around 7:00 p.m Alert Bay fire crews were called to a structure fire that had started in one house and jumped to another, engulfing both in flames. There were no injuries recorded as one house was vacant, and the homeowner of the other was away at the time of the fire. Alert Bay RCMP who partnered with Port McNeil RCMP and Port Hardy RCMP were also called to the scene and they quickly determined that the fire was suspicious in nature. Constable Chris Manseau, the Alert Bay media relations officer says any information about the fire can be useful. The investigation is ongoing and two suspects have been identified, both under the ages of 18. According to Alert Bay RCMP they have been released from custody. If charges are laid, they will be charged as youth. The RCMP Vancouver Island General Investigation Section and Forensic Identification Section are now among those helping the Alert Bay RCMP with the investigation. If you have any information on the fire you’re asked to contact Alert Bay RCMP at 250-974-5544.